Massachusetts General Hospital (MGH) investigators have identified the first potential molecular treatment target for the most common form of pancreatic cancer, which kills more than 90 percent of patients. Along with finding that the tumor suppressor protein SIRT6 is inactive in around 30 percent of cases of pancreatic ductal adenocarcinoma (PDAC), the team identified the precise pathway by which SIRT6 suppresses PDAC development, a mechanism different from the way it suppresses colorectal cancer. The paper will appear in the June 2 issue of Cell and have been published online. Among its other functions, SIRT6 is known to control how cells process glucose, and a 2012 study by Mostoslavsky’s team found that its ability to suppress colorectal cancer involves control of a process called glycolysis. But while that study also found reduced SIRT6 expression in PDAC tumor cells, the current investigation indicated that SIRT6 deficiency promotes PDAC through a different mechanism. Experiments in cell lines and animal models revealed that low SIRT6 levels in PDAC were correlated with increased expression of Lin28b, an oncoprotein normally expressed during fetal development. 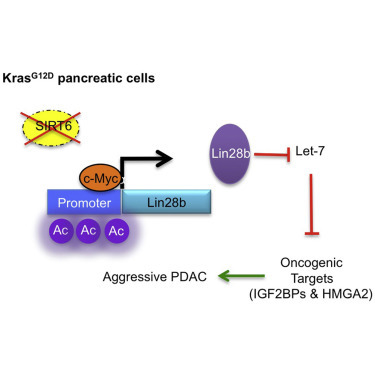 Lin28b expression proved to be essential to the growth and survival of SIRT6-deficient PDAC cells and acted by preventing a family of tumor-suppressing mRNAs called let-7 from blocking expression of three genes previously associated with increased aggressiveness and metastasis in pancreatic cancers. All of these hallmarks – reduced SIRT6, increased Lin28b and reduced let-7 expression – were found in tumor samples from patients who died more quickly. Chromatin remodeling proteins are frequently dysregulated in human cancer, yet little is known about how they control tumorigenesis. Here, we uncover an epigenetic program mediated by the NAD+-dependent histone deacetylase Sirtuin 6 (SIRT6) that is critical for suppression of pancreatic ductal adenocarcinoma (PDAC), one of the most lethal malignancies. SIRT6 inactivation accelerates PDAC progression and metastasis via upregulation of Lin28b, a negative regulator of the let-7 microRNA. SIRT6 loss results in histone hyperacetylation at theLin28b promoter, Myc recruitment, and pronounced induction of Lin28b and downstream let-7 target genes, HMGA2, IGF2BP1, and IGF2BP3. This epigenetic program defines a distinct subset with a poor prognosis, representing 30%–40% of human PDAC, characterized by reduced SIRT6 expression and an exquisite dependence on Lin28b for tumor growth. Thus, we identify SIRT6 as an important PDAC tumor suppressor and uncover the Lin28b pathway as a potential therapeutic target in a molecularly defined PDAC subset. The sirtuins (SIRTs; of which there are seven in mammals) are NAD+-dependent enzymes that regulate a large number of cellular pathways and forestall the progression of ageing and age-associated diseases. In recent years, the role of sirtuins in cancer biology has become increasingly apparent, and growing evidence demonstrates that sirtuins regulate many processes that go awry in cancer cells, such as cellular metabolism, the regulation of chromatin structure and the maintenance of genomic stability. In this article, we review recent advances in our understanding of how sirtuins affect cancer metabolism, DNA repair and the tumour microenvironment and how activating or inhibiting sirtuins may be important in preventing or treating cancer. PNAS | July 22, 2014;111(29): 10684–10689 | http://www.pnas.org/content/111/29/10684.full.pdf http://www.pnas.org/lookup/suppl/doi:10. 1073/pnas.1411026111/-/DCSupplemental. In mammalian cells, tumor suppressor p53 plays critical roles in the regulation of glucose metabolism, including glycolysis and oxidative phosphorylation, but whether and how p53 also regulates gluconeogenesis is less clear. Here, we report that p53 efficiently down-regulates the expression of phosphoenolpyruvate carboxykinase (PCK1) and glucose-6-phosphatase (G6PC), which encode rate-limiting enzymes in gluconeogenesis. Cell-based assays demonstrate the p53-dependent nuclear exclusion of forkhead box protein O1 (FoxO1), a key transcription factor that mediates activation of PCK1 and G6PC, with consequent alleviation of FoxO1- dependent gluconeogenesis. Further mechanistic studies show that p53 directly activates expression of the NAD+-dependent histone deacetylase sirtuin 6 (SIRT6), whose interaction with FoxO1 leads to FoxO1 deacetylation and export to the cytoplasm. In support of these observations, p53-mediated FoxO1 nuclear exclusion, down-regulation of PCK1 and G6PC expression, and regulation of glucose levels were confirmed in C57BL/J6 mice and in liver-specific Sirt6 conditional knockout mice. Our results provide insights into mechanisms of metabolism-related p53 functions that may be relevant to tumor suppression. As the “guardian of the genome,” tumor suppressor p53 has been reported to coordinate diverse cellular responses to a broad range of environment stresses (1) and to play antineoplastic roles by activating downstream target genes involved in DNA damage repair, apoptosis, and cell-cycle arrest (2). Recent studies have indicated broader roles for p53 in mediating metabolic changes in cells under various physiological and pathological conditions (3–7). For example, p53 was reported to influence the balance between glycolysis and oxidative phosphorylation by inducing the p53-induced glycolysis and apoptosis regulator (TIGAR) and by regulating the synthesis of cytochrome c oxidase 2 (SCO2) (3), respectively, thus promoting the switch from glycolysis to oxidative phosphorylation. p53 also may impede metabolism by reducing glucose import (4) or by inhibiting the pentose phosphate pathway (PPP) (5). More recently, context-dependent inhibitory (6) or stimulatory (7, 8) effects of p53 on gluconeogenesis have been reported. It thus is clear that p53 plays important roles in glucose regulation in mammalian cells. Glucose homeostasis is maintained by a delicate balance between intestinal absorption of sugar, gluconeogenesis, and the utilization of glucose by the peripheral tissues, irrespective of feeding or fasting (9). The gluconeogenesis pathway is catalyzed by several key enzymes that include the first and last rate-limiting enzymes of the process, phosphoenolpyruvate carboxykinase (PCK1) and glucose-6-phosphatase (G6PC), respectively. The expression of both PCK1 and G6PC is controlled mainly at the transcription level. For example, the transcription factor forkhead box protein O1 (FoxO1) activates gluconeogenesis through direct binding to the promoters of G6PC and PCK1 (10). A dominant negative FoxO1 lacking its transactivation domain significantly decreases gluconeogenesis (11) whereas FoxO1 ablation impairs fasting- and cAMP-induced PCK1 and G6PC expression (12). Therefore, factors influencing expression of FoxO1 or its binding activity to the PCK1 and G6PC promoters are potential targets for gluconeogenesis regulation. The transcription activity of FoxO family members is regulated by a sophisticated signaling network. Various environmental stimuli cause different posttranslational modifications of FoxO proteins, including phosphorylation, acetylation, ubiquitination, and methylation (13–15). The phosphorylation of FoxO proteins is known to be essential for their shuttling between the nucleus and cytoplasm. For example, kinase Akt/PKB phosphorylates FoxO1 at threonine 24 and at serines 256 and 319, which in turn leads to 14-3-3 binding and subsequent cytoplasmic sequestration. The acetylation of FoxO proteins also affects their trafficking and DNA-binding activities (15–17). Sirtuin (SIRT)1, a homolog of the yeast silent information regulator-2 (Sir2), has been identified as a deacetylase for FoxO proteins (15, 17, 18). Of the seven mammalian sirtuins, SIRT1, SIRT6, and SIRT7 are localized to the nucleus (19), and SIRT6 was recently reported to act as a central player in regulating the DNA damage response, glucose metabolism, and aging (20–26). Using a knockout mouse model, it was found that SIRT6 functions as a corepressor of the transcription factor Hif1α to suppress glucose uptake and glycolysis. Significance: Beyond its canonical functions in processes such as cell-cycle arrest, apoptosis, and senescence, the tumor suppressor p53 has been increasingly implicated in metabolism. Here, in vitro and in vivo studies establish a role for p53 in gluconeogenesis through a previously unidentified mechanism involving (i) direct activation of the gene encoding the NAD-dependent deacetylase sirtuin 6 (SIRT6), (ii) SIRT6-dependent deacetylation and nuclear exclusion of forkhead box protein O1 (FoxO1), and (iii) downregulation of FoxO1-activated genes (G6PC and PCK1) that are rate-limiting for gluconeogenesis. These results have implications for proposed tumor-suppressor functions of p53 through regulation of metabolic pathways. Among a variety of other functions, SIRT6 was previously connected to glucose metabolism. For example, SIRT6 acts as a corepressor of the transcription factor Hif1-α to suppress glycolysis (23). Conversely, the deletion of Sirt6 in mice results in severe hypoglycemia (33) whereas the liver-specific deletion of Sirt6 leads to increased glycolysis and triglyceride synthesis (23, 34). Our study adds further evidence that SIRT6 plays an important role in glucose metabolism by connecting p53 transcription activity and gluconeogenesis. Our data also reemphasize a previously established role for SIRT6 in regulating the acetylation state and nuclear localization of FoxO proteins, albeit in a divergent manner. Thus, the Caenorhabditis elegans SIRT6/7 homolog SIR-2.4 was implicated in DAF-16 deacetylation and consequent nuclear localization and function in stress responses (35); and the effect was reported to be indirect and to involve a stress-induced inhibition by SIR-2.4 of CBP-mediated acetylation of DAF-16 that is independent of its deacetylase activity. These results, emphasizing context-dependent SIRT6 mechanisms, contrast with the SIRT6 deacetylase activity requirement for FoxO1 nuclear exclusion in the present study and a likely direct effect of SIRT6 on FoxO1 deacetylation based on their direct interaction, the SIRT6 deacetylase activity requirement, and precedent (15, 17, 18) from direct SIRT1-mediated deacetylation of FoxO proteins. Despite a high genetic diversity, cancer cells exhibit a common set of functional characteristics, one being the “Warburg effect”: i.e., continuous high glucose uptake and a higher rate of glycolysis than that in normal cells (36). To favor the rapid proliferation requirement for high ATP/ADP and ATP/AMP ratios, cancer cells use large amounts of glucose. p53, as one of the most important tumor suppressors, exerts its antineoplastic function through diverse pathways that include the regulation of glucose metabolism. Thus, p53 regulates glucose metabolism by activation of TIGAR (3), which lowers the intracellular concentrations of fructose-2,6-bisphosphate and decreases glycolysis. On the other hand, p53 activation causes down-regulation of several glycolysisrelated factors such as phosphoglycerate mutase (PGM) (37) and the glucose transporters (4). Expression of p53 also can limit the activity of IκBα and IκBβ, thereby restricting the activation of NFκB and dampening the expression of glycolysis-promoting genes such as GLUT3 (38). As a reverse glycolysis pathway, gluconeogenesis generates glucose from noncarbohydrate precursors and is conceivably essential for tumor cell growth. However, the current study further supports the notion (6) that p53 is also involved in a gluconeogenesis inhibition pathway, which in this case is executed by enhanced SIRT6 expression and subsequent FoxO1 nuclear exclusion. These results raise the interesting possibility that an inhibition of gluconeogenesis may contribute to the tumorsuppressive function of p53. A protein known to regulate how cells process glucose also appears to be a tumor suppressor, adding to the potential that therapies directed at cellular metabolism may help suppress tumor growth. In their report in the Dec. 7 issue of Cell, a multi-institutional research team describes finding that cells lacking the enzyme SIRT6, which controls how cells process glucose, quickly become cancerous. They also found evidence that uncontrolled glycolysis, a stage in normal glucose metabolism, may drive tumor formation in the absence of SIRT6 and that suppressing glycolysis can halt tumor formation. The hypothesis that a switch in the way cells process glucose could set off tumor formation was first proposed in the 1920s by German researcher Otto Warburg, who later received the Nobel Prize for discoveries in cellular respiration. He observed that, while glucose metabolism is normally a two-step process involving glycolysis in the cellular cytoplasm followed by cellular respiration in the mitochondria, in cancer cells rates of glycolysis are up to 200 times higher. Warburg’s proposition that this switch in glucose processing was a primary cause of cancer did not hold up, as subsequent research supported the role of mutations in oncogenes, which can spur tumor growth if overexpressed, and tumor suppressors, which keep cell proliferation under control. But recent studies have suggested that alterations in cellular metabolism may be part of the process through which activated oncogenes or inactivated tumor suppressors stimulate cancer formation. A 2010 study led by Mostoslavsky found that the absence of SIRT6 – one of a family of proteins called sirtuins that regulate many important biological pathways – appears to “flip the switch” from normal glucose processing to the excess rates of glycolysis seen in cancer cells. The current study was specifically designed to investigate whether SIRT6’s control of glucose metabolism also suppresses tumor formation. The research team first showed that cultured skin cells from embryonic mice lacking SIRT6 proliferated rapidly and quickly formed tumors when injected into adult mice. They also confirmed elevated glycolysis levels in both cells lacking SIRT6 and tumor cells and found that formation of tumors through SIRT6 deficiency did not appear to involve oncogene activation. Analysis of tumor samples from patients found reduced SIRT6 expression in many – particularly in colorectal and pancreatic tumors. Even among patients whose tumors appeared to be more aggressive, higher levels of SIRT6 expression may have delayed or, for some, prevented relapse. In a mouse model programmed to develop numerous colon polyps, the researchers showed that lack of intestinal SIRT6 expression tripled the formation of polyps, many of which became invasive tumors. Treating the animals with a glycolytic inhibitor significantly reduced tumor formation, even in the absence of SIRT6. Reprogramming of cellular metabolism is a key event during tumorigenesis. Despite being known for decades (Warburg effect), the molecular mechanisms regulating this switch remained unexplored. Here, we identify SIRT6 as a novel tumor suppressor that regulates aerobic glycolysis in cancer cells. Importantly, loss of SIRT6 leads to tumor formation without activation of known oncogenes, while transformed SIRT6-deficient cells display increased glycolysis and tumor growth, suggesting that SIRT6 plays a role in both establishment and maintenance of cancer. Using a conditional SIRT6 allele, we show that SIRT6 deletion in vivoincreases the number, size and aggressiveness of tumors. SIRT6 also functions as a novel regulator of ribosome metabolism by co-repressing MYC transcriptional activity. Lastly, SIRT6 is selectively downregulated in several human cancers, and expression levels of SIRT6 predict prognosis and tumor-free survival rates, highlighting SIRT6 as a critical modulator of cancer metabolism. Our studies reveal SIRT6 to be a potent tumor suppressor acting to suppress cancer metabolism. Cancer cells are characterized by the acquisition of several characteristics that enable them to become tumorigenic (Hanahan and Weinberg, 2000). Among them, the ability to sustain uncontrolled proliferation represents the most fundamental trait of cancer cells. This hyperproliferative state involves the deregulation of proliferative signaling pathways as well as loss of cell cycle regulation. In addition, tumor cells need to readjust their energy metabolism to fuel cell growth and division. This metabolic adaptation is directly regulated by many oncogenes and tumor suppressors, and is required to support the energetic and anabolic demands associated with cell growth and proliferation (Lunt and Vander Heiden, 2011). Alteration in glucose metabolism is the best-known example of metabolic reprogramming in cancer cells. Under aerobic conditions, normal cells convert glucose to pyruvate through glycolysis, which enters the mitochondria to be further catabolized in the tricarboxylic acid cycle (TCA) to generate adenosine-5’-triphosphate (ATP). Under anaerobic conditions, mitochondrial respiration is abated; glucose metabolism is shifted towards glycolytic conversion of pyruvate into lactate. This metabolic reprogramming is also observed in cancer cells even in the presence of oxygen and was first described by Otto Warburg several decades ago (Warburg, 1956; Warburg et al., 1927). By switching their glucose metabolism towards “aerobic glycolysis”, cancer cells accumulate glycolytic intermediates that will be used as building blocks for macromolecular synthesis (Vander Heiden et al., 2009). Most cancer cells exhibit increased glucose uptake, which is due, in part, to the upregulation of glucose transporters, mainly GLUT1 (Yamamoto et al., 1990; Younes et al., 1996). Moreover, cancer cells display a high expression and activity of several glycolytic enzymes, including phospho-fructose kinase (PFK)-1, pyruvate kinase M2, lactate dehydrogenase (LDH)-A and pyruvate dehydrogenase kinase (PDK)-1 (Lunt and Vander Heiden, 2011), leading to the high rate of glucose catabolism and lactate production characteristic of these cells. Importantly, downregulation of either LDH-A or PDK1 decreases tumor growth (Bonnet et al., 2007; Fantin et al., 2006; Le et al., 2010) suggesting an important role for these proteins in the metabolic reprogramming of cancer cells. Traditionally, cancer-associated alterations in metabolism have been considered a secondary response to cell proliferation signals. However, growing evidence has demonstrated that metabolic reprogramming of cancer cells is a primary function of activated oncogenes and inactivated tumor suppressors (Dang et al., 2012;DeBerardinis et al., 2008; Ward and Thompson, 2012). Despite this evidence, whether the metabolic reprogramming observed in cancer cells is a driving force for tumorigenesis remains as yet poorly understood. Sirtuins are a family of NAD+-dependent protein deacetylases involved in stress resistance and metabolic homeostasis (Finkel et al., 2009). In mammals, there are seven members of this family (SIRT1-7). SIRT6 is a chromatin-bound factor that was first described as a suppressor of genomic instability (Mostoslavsky et al., 2006). SIRT6 also localizes to telomeres in human cells and controls cellular senescence and telomere structure by deacetylating histone H3 lysine 9 (H3K9) (Michishita et al., 2008). However, the main phenotype SIRT6 deficient mice display is an acute and severe metabolic abnormality. At 20 days of age, they develop a degenerative phenotype that includes complete loss of subcutaneous fat, lymphopenia, osteopenia, and acute onset of hypoglycemia, leading to death in less than ten days (Mostoslavsky et al., 2006). Recently, we have demonstrated that the lethal hypoglycemia exhibited by SIRT6 deficient mice is caused by an increased glucose uptake in muscle and brown adipose tissue (Zhong et al., 2010). Specifically, SIRT6 co-represses HIF-1α by deacetylating H3K9 at the promoters of several glycolytic genes and, consequently, SIRT6 deficient cells exhibit increased glucose uptake and upregulated glycolysis even under normoxic conditions (Zhong et al., 2010). Such a phenotype, reminiscent of the “Warburg Effect” in tumor cells, prompted us to investigate whether SIRT6 may protect against tumorigenesis by inhibiting glycolytic metabolism. Here, we demonstrate that SIRT6 is a novel tumor suppressor that regulates aerobic glycolysis in cancer cells. Strikingly, SIRT6 acts as a first hit tumor suppressor and lack of this chromatin factor leads to tumor formation even in non-transformed cells. Notably, inhibition of glycolysis in SIRT6 deficient cells completely rescues their tumorigenic potential, suggesting that enhanced glycolysis is the driving force for tumorigenesis in these cells. Furthermore, we provide new data demonstrating that SIRT6 regulates cell proliferation by acting as a co-repressor of c-Myc, inhibiting the expression of ribosomal genes. Finally, SIRT6 expression is downregulated in human cancers, strongly reinforcing the idea that SIRT6 is a novel tumor suppressor. In addition to controlling glucose metabolism in cancer cells, our current work unravels a novel function of SIRT6 as a regulator of ribosomal gene expression. One of the main features of cancer cells is their high proliferative potential. In order to proliferate, cancer cells readjust their metabolism to generate biosynthetic precursors for macromolecular synthesis (Deberardinis et al., 2008). However, protein synthesis also requires the activation of a transcriptional program leading to ribosome biogenesis and mRNA translation (van Riggelen et al., 2010). As a master regulator of cell proliferation, MYC regulates ribosome biogenesis and protein synthesis by controlling the transcription and assembly of ribosome components as well as translation initiation (Dang et al., 2012; van Riggelen et al., 2010). Our results show that SIRT6 specifically regulates the expression of ribosomal genes. In keeping with this, SIRT6-deficient tumor cells exhibit high levels of ribosomal protein gene expression. Beyond ribosome biosynthesis, MYC regulates glucose and glutamine metabolism (Dang et al., 2012). Our results show that glutamine – but not glucose – metabolism is rescued in SIRT6-deficient/MYC knockdown cells, suggesting that SIRT6 and MYC might have redundant roles in regulating glucose metabolism. Overall, our results indicate that SIRT6 represses tumorigenesis by inhibiting a glycolytic switch required for cancer cell proliferation. Inhibition of glycolysis in SIRT6-deficient cells abrogates tumor formation, providing proof of concept that inhibition of glycolytic metabolism in tumors with low SIRT6 levels could provide putative alternative approaches to modulate cancer growth. Furthermore, we uncover a new role for SIRT6 as a regulator of ribosome biosynthesis by co-repressing MYC transcriptional activity. Our results indicate that SIRT6 sits at a critical metabolic node, modulating both glycolytic metabolism and ribosome biosynthesis (Figure 7L). SIRT6 deficiency deregulates both pathways, leading to robust metabolic reprogramming that is sufficient to promote tumorigenesis bypassing major oncogenic signaling pathway activation. A study investigating how a cellular enzyme affects blood glucose levels in mice provides clues to pathways that may be involved in processes including the regulation of longevity and the proliferation of tumor cells. In their report in the January 22 issue of Cell, a Massachusetts General Hospital (MGH)-based team of researchers describes the mechanism by which absence of the enzyme SIRT6 induces a fatal drop in blood sugar in mice by triggering a switch between two critical cellular processes. SIRT6 belongs to a family of proteins called sirtuins, which regulate important biological pathways in organisms from bacteria to humans. Originally discovered in yeast, sirtuins in mammals have been shown to have important roles in metabolic regulation, programmed cell death and adaptation to stress. SIRT6 is one of seven mammalian sirtuins, and Mostoslavsky’s team previously showed that mice lacking the protein die in the first month of life from acute hypoglycemia. The current study was designed to investigate exactly how lack of SIRT6 causes this radical drop in blood sugar. Normally cells convert glucose into energy through a two-step process. The first stage called glycolysis takes place in the cytoplasm, where glucose is broken down into an acid called pyruvate and a few molecules of ATP, the enzyme that provides the energy to power most biological processes. Pyruvate is taken into cellular structures called mitochondria, where it is further processed to release much greater amounts of ATP through a process called cellular respiration. In a series of experiments in mouse cells, the researchers showed that SIRT6-deficiency hypoglycemia is caused by increased cellular uptake of glucose and not by elevated insulin levels or defects in the absorption of glucose from food. They then found increased levels of glycolysis and reduced mitochondrial respiration in SIRT6-knockout cells, something usually seen when cells are starved for oxygen or glucose, and showed that activation of the switch from cellular respiration to glycolysis is controlled through SIRT6’s regulation of a protein called HIF1alpha. Normally, SIRT6 represses glycolytic genes through its role as a compactor of chromatin – the tightly wound combination of DNA and a protein backbone that makes up chromosomes. In the absence of SIRT6, this structure is opened, causing activation of these glycolytic genes. The investigators’ finding increased expression of glycolytic genes in living SIRT6-knockout mice – which also had elevated levels of lactic acid, characteristic of a switch to glycolytic glucose processing – supported their cellular findings. Studies in yeast, worms and flies have suggested a role for sirtuins in aging and longevity, and while much of the enzymes’ activity in mammals is unclear, SIRT6’s control of critical glucose-metabolic pathways could signify a contribution to lifespan regulation. Elevated glycolysis also is commonly found in tumor cells, suggesting that a lack of SIRT6 could contribute to tumor growth. Conversely, since knocking out SIRT6 causes blood sugar to drop, limited SIRT6 inhibition could be a novel strategy for treating type 2 diabetes. Mitochondrial metabolism influences histone and DNA modifications by retrograde signaling and activation of transcriptional programs. Considering the high number of putative sites for acetylation and methylation in chromatin, we propose in this Perspective that epigenetic modifications might impinge on cellular metabolism by affecting the pool of acetyl-CoA and SAM. Metabolism can be defined as the sum of chemical reactions that occur within a cell to sustain life. It is also the way that a cell interacts with energy sources: in other words, it is the coordination of energy intake, its utilization and storage that ultimately allows growth and cell division. In animal cells, mitochondria have evolved to become the most efficient system to generate energy. This organelle consumes carbon sources via oxidative phosphorylation to produce ATP, the energy currency of the cell. Additionally, the mitochondria produces intermediate metabolites for the biosynthesis of DNA, proteins and lipids. Under basic dividing conditions, uptake of nutrients is tightly regulated through growth signaling pathways, thus differentiated cells engage in oxidative metabolism, the most efficient mechanism to produce energy from nutrients. Cells metabolize glucose to pyruvate through glycolysis in the cytoplasm, and this pyruvate is then oxidized into CO2 through the mitochondrial TCA cycle. The electrochemical gradient generated across the inner mitochondrial membrane facilitates ATP production in a highly efficient manner. Studies in recent years indicate that under conditions of nutrient excess, cells increase their nutrient uptake, adopting instead what is known as aerobic glycolysis, an adaptation that convert pyruvate into lactate, enabling cells to produce intermediate metabolites to sustain growth (anabolic metabolism) (1). Interestingly, most cancer cells undergo the same metabolic switch (Warburg Effect), a unique evolutionary trait that allows them to grow unabated. Although aerobic glycolysis generates much less ATP from glucose compared to oxidative phosphorylation, it provides critical intermediate metabolites that are used for anaplerotic reactions, and therefore is an obligatory adaptation among highly proliferative cells. In response to variations in nutrient availability, cells regulate their metabolic output, coordinating biochemical reactions and mitochondrial activity by altering transcription of mitochondrial genes through both activation of transcription factors, such as PGC1α, and chromatin modulators that exert epigenetic changes on metabolic genes. Mitochondrial dysfunction has been implicated in aging, degenerative diseases and cancer. Proper mitochondrial function can be compromised by the accumulation of mutations in mitochondrial DNA that occur during aging. In addition, reactive oxygen species (ROS) produced during oxidative phosphorylation can promote oxidative damage to DNA, protein and lipids, in turn adversely affecting global cellular functions. In recent years, several studies have illustrated a novel unexpected link between metabolism and gene activity: fluctuations in mitochondrial and cytoplasmic metabolic reactions can reprogram global metabolism by means of impacting epigenetic dynamics. These studies will be briefly summarized in the first part of this article. In the second part, we will propose a provocative novel hypothesis: the crosstalk between metabolism and epigenetics is a two-way street, and defects in chromatin modulators may affect availability of intermediate metabolites, in turn influencing energy metabolism. 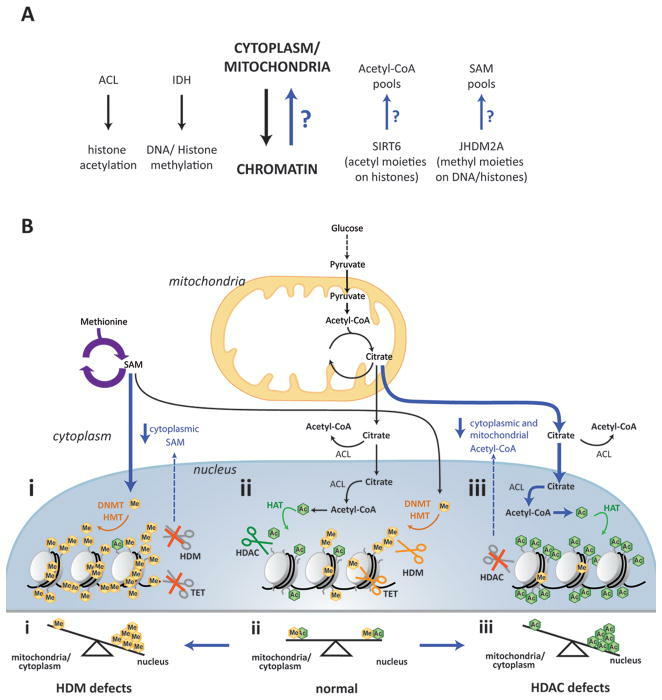 A regulated crosstalk between metabolic pathways in the mitochondria and epigenetic mechanisms in the nucleus allows cellular adaptations to new environmental conditions. Fine-tuning of gene expression is achieved by changes in chromatin dynamics, including methylation of DNA and posttranslational modifications of histones: acetyl, methyl and phosphate groups can be added by acetyltransferases, methyltransferases and kinases, respectively, to different residues on histones. Given the number of residues that can potentially undergo modifications in histone tails and in the DNA, it is reasonable to consider that metabolic changes affecting the availability of these metabolites will impact epigenetics (as discussed below). Recently, acetylation of proteins was revealed to be as abundant as phosphorylation (2). This posttranslational modification involves the covalent binding of an acetyl group obtained from acetyl-CoA to a lysine. In histones, acetylation can modify higher order chromatin structure and serve as a docking site for histone code readers. Recent mass spectrometry studies have uncovered the complete acetylome in human cells and revealed that protein acetylation occurs broadly in the nucleus, cytoplasm and mitochondria, affecting more than 1700 proteins (2). Acetylation of proteins depends on the availability of acetyl-CoA in each cellular compartment, but this metabolite is produced in the mitochondria and cannot cross the mitochondrial membrane. In single cell eukaryotes, the pool of acetyl groups required for histone acetylation comes from the production of acetyl-CoA by the enzyme acetyl-CoA synthetase (Acs2p), which is responsible of converting acetate into acetyl-CoA. In mammalian cells, although they have a homolog enzyme to Acs2p, AceCS1, the majority of acetyl-CoA is produced from mitochondrion-derived citrate by the enzyme adenosine triphosphate (ATP)-citrate lyase (ACL) (3). ACL is present in the cytoplasm and in the nucleus, and is responsible for the production of acetyl-CoA from citrate in both compartments. Citrate is generated in the metabolism of glucose and glutamine in the TCA cycle. In contrast to acetyl-CoA, citrate can cross the mitochondrial membrane and diffuse through the nuclear pores into the nucleus, where it can be converted into acetyl-CoA by ACL. Wellen and colleagues found that ACL is required for acetylation of histones under normal growth conditions; knockdown of ACL decreases the pool of acetyl-CoA in the nucleus and reduces the level of histone acetylation (3). Strikingly, reduction in histone acetylation occurs preferentially around glycolytic genes, leading to downregulation of their transcription and therefore inhibition of glycolysis. These observations reveal a process where glucose metabolism dictates histone acetylation that in a feedback mechanism controls the rate of glycolysis. Notably, deacetylation of histones also exhibits a metabolic influence. Deacetylation of histones is achieved by class I and class II histone deacetylases (HDACs) and by a separate class (class III), also known as sirtuins. Sirtuins use NAD+ as a cofactor for deacetylation, and the ratio of NAD+/NADH regulates their activity. In diets rich in carbohydrates, growth factors stimulate cellular glucose uptake and the production of energy is carried out through glycolysis. In this context, the NAD+/NADH ratio decreases, in turn inhibiting, in theory, sirtuins in the cytoplasm (Sirt2) and nucleus (Sirt1, Sirt6 and Sirt7). In fact, low Sirt1 and Sirt6 activity generates a global increase in protein acetylation. Interestingly, Sirt6, which is exclusively nuclear, deacetylates H3K9 Hif1α target genes, repressing their transcription. Since most of these genes are glycolytic, deacetylation of histones by Sirt6 modulates glycolysis. Indeed, SIRT6-deficient mice experience a dramatic increase in glucose uptake for glycolysis, triggering a fatal hypoglycemia in few weeks (4). In animal cells, both histone acetylation and deacetylation are under the control of glucose metabolism through the availability of acetyl-CoA and NAD+, respectively. However, is this metabolic control restricted to acetylation, or can other reactions in the nucleus be influenced by the energy status of the cell? Histone methyltransferases (HMTs) use S-adenosylmethionine (SAM) to transfer a methyl group onto lysine and arginine residues on histone tails. SAM is produced from methionine by the enzyme S-adenosyl methionine transferase (MAT) in a reaction that uses ATP. The recent finding of MAT in the nucleus suggests that the SAM pool could also be controlled locally in this compartment (5). The reverse reaction catalyzed by histone demethylases (HDMs) uses flavin adenine dinucleotide (FAD+) and α-ketoglutarate as coenzymes. FAD is a common redox coenzyme that exists in two different redox states. In its reduced state, FADH2 is a carrier of energy and when oxidized, FAD+ is consumed in the oxidation of succinate to fumarate by the enzyme succinate dehydrogenase (complex II) in one of the last steps of the TCA cycle. On the other hand, α-ketoglutarate is an intermediate in the TCA cycle. It is generated from isocitrate by the enzymes isocitrate dehydrogenase 1 and 2 (IDH1-cytosolic and IDH2-mitochondrial) (Figure 1A–B). Based on these findings, it is easy to infer that the amount of coenzymes used for histone methylation and demethylation could also be controlled by metabolic reactions. Moreover, the different cellular compartments compete for the same metabolites. Indeed, changes in diet that affect the biosynthesis of SAM, FAD and α-ketoglutarate in the mitochondria and cytoplasm have been shown to impact histone methylation (6). Figure 1 A) Diagram depicting two-way crosstalk between metabolites in cytoplasm/mitochondria and chromatin. More recently, some of the metabolic enzymes responsible for producing cofactors for nuclear biochemical reactions have been found mutated in cancer. For instance, IDH1 and IDH2 somatic mutations are recurrent in gliomas and acute myeloid leukemias (AML). These mutations lead not only to a decreased production of α-ketoglutarate but also to a new activity: α-ketoglutarate is in fact converted into 2-hydroxyglutarate (2-HG), a metabolite rarely found in normal cells. The new metabolite is a competitive inhibitor of α-ketoglutarate-dependent dioxygenase enzymes, including the Jumonji C (JmjC) domain containing histone demethylases and the recently discovered TET family of 5-methylcytosine (5mC) hydroxylases involved in DNA demethylation (7). By inhibiting JmjC and TET enzymes, the aberrant production of 2-HG generates a genome-wide histone and DNA hypermethylation phenotype. This is considered to be, at least in part, at the origin of tumorigenesis in IDH1 and IDH2 mutated cells and for this reason, 2-HG may earn its place as an oncometabolite. The discovery that mutations in metabolic enzymes may influence tumorigenesis by means of controlling genome-wide epigenetic changes caused a paradigm shift, indicating that such metabolic abnormalities may affect cancer beyond the Warburg Effect. …. Chromatin modifications and cellular metabolism are tightly connected. Thus far the only aspects that have been considered are the retrograde signaling, with mitochondrial metabolites affecting histone modifications, and the anterograde transcriptional regulation of metabolism. A third aspect of the link between nucleus and metabolism has been, in our opinion, omitted so far: a direct influence of chromatin on acetyl-CoA and SAM availability, which may have an essential role also in cancer establishment and development (Figure 1A–B). Notably, a shift towards glycolytic metabolism is now considered a hallmark of cancer cells. It is also true that multiple tumors carry mutations in chromatin modifiers. However, new studies suggest that those two processes may be much more intertwined that previously appreciated, further blurring the limits on their respective roles in tumorigenesis. There is no doubt that changes in metabolite availability can drastically impact chromatin modifications. We believe that the opposite may be true as well. At least in mouse models, deficiency in two chromatin modifiers, SIRT6 and Jhdm2, causes drastic metabolic abnormalities. Even though some of those phenotypes depend on changes in gene-expression, we would like to propose that severe attrition of metabolite pools might as well play a role, a possibility that awaits experimental proof. Investigators at UC San Diego say that when they blocked a well known signaling molecule that plays a major role in driving colorectal cancer, an escape pathway emerged that allowed tumors to continue to grow. The pathway they explored, ERK1/2, is a problem for about a third of all colorectal cancer patients, says Petrus R. de Jong, MD, PhD, a co-first author on the paper. The problem was ERK5, the investigators add. And when that was blocked as well in animal models and cell lines for the disease, the combination approach proved more effective in halting cancer growth. An international research team lead by scientists at the University of California San Diego School of Medicine uncovered some surprising results while investigating a potential therapeutic target for the ERK1 and two pathways. These signaling pathways are widely expressed and known to drive cancer growth in one-third of patients with colorectal cancer (CRC). The UCSD team found that an alternative pathway immediately emerges when ERK1/2 is halted, thus allowing tumor cell proliferation to continue. The exciting part of this new study is investigators found that treating both ERK1/2 and the compensatory pathway ERK5 concomitantly with a combination of drug inhibitors halted CRC growth more effectively in both mouse models and human CRC cell lines. The ERK pathway plays a critical role in embryonic development and tissue repair because it instructs cells to multiply and start dividing, but when overactivated cancer growth often occurs. Currently, there are 1.2 million people living with CRC in the United States, making it the third most common cancer among men and women. In 2016 alone, an estimated 134,490 new cases are expected to be diagnosed, so understanding the molecular mechanisms that drive tumor promotion are paramount to treating this disease effectively. The researchers were excited by their findings but urged caution at over interpretation of their initial findings and suggested that other classes of inhibitors be tested in combination with ERK5 inhibitors in human CRC cells in preclinical mouse models before any patient trial can begin. The ERK1/2 MAPK signalling module integrates extracellular cues that induce proliferation and differentiation of epithelial lineages, and is an established oncogenic driver, particularly in the intestine. However, the interrelation of the ERK1/2 module relative to other signalling pathways in intestinal epithelial cells and colorectal cancer (CRC) is unclear. Here we show that loss of Erk1/2in intestinal epithelial cells results in defects in nutrient absorption, epithelial cell migration and secretory cell differentiation. However, intestinal epithelial cell proliferation is not impeded, implying compensatory mechanisms. Genetic deletion of Erk1/2 or pharmacological targeting of MEK1/2 results in supraphysiological activity of the ERK5 pathway. Furthermore, targeting both pathways causes a more effective suppression of cell proliferation in murine intestinal organoids and human CRC lines. These results suggest that ERK5 provides a common bypass route in intestinal epithelial cells, which rescues cell proliferation upon abrogation of ERK1/2 signalling, with therapeutic implications in CRC. The extracellular signal-regulated kinases 1 and 2 (ERK1/2) are part of the classical family of mammalian mitogen-activated protein kinases (MAPKs), which also include three c-Jun amino-terminal kinases (JNK1/2/3), four p38 isoforms and its lesser-known counterpart, ERK5. The serine/threonine kinases ERK1 (MAPK3, also known as p44 MAPK) and ERK2 (MAPK1, also known as p42 MAPK) show 83% amino acid identity, are ubiquitously expressed and typically activated by growth factors and phorbol esters, whereas the p38 and JNK pathways are mainly activated by inflammatory cytokines and stress1. MAPKs are involved in regulation of mitosis, gene expression, cell metabolism, cell motility and apoptosis. ERK1/2 are activated by MEK1 and MEK2, which themselves are activated by Raf-1, A-Raf or B-Raf1, 2. Ras proteins (K-Ras, H-Ras or N-Ras) are small GTPases that can be activated by receptor tyrosine kinases (RTKs) or G-protein coupled receptors (GPCRs), which recruit Raf proteins to the plasma membrane where they are activated. Together, these modules constitute the Ras–Raf–MEK–ERK pathway3. The activation of ERK1/2 results in their nuclear translocation where they can phosphorylate a variety of nuclear targets such as Elk-1, c-Fos and c-Myc1, in addition to p90 ribosomal S6 kinases (p90RSKs) and mitogen- and stress-activated protein kinases, MSK1/2. The full repertoire of substrates for ERK1/2 consists of at least 160 cellular proteins4. These proteins are typically involved in the regulation of cell proliferation—more specifically, G1/S-phase cell cycle progression—and differentiation. However, their cellular effects are context-dependent and determined by the spatial and temporal dynamics of ERK1/2 activity5, which are highly regulated by scaffolding proteins and phosphatases3, 6, 7. Despite vast literature on the role of ERK1/2 in cell proliferation, the absolute requirement of this signalling module in rapidly dividing tissues relative to other signalling pathways is unknown. The small intestinal epithelium is particularly suitable to address this question given the short (4–8 days) and dynamic life cycle of intestinal epithelial cells (IECs). Lgr5+ intestinal stem cells at the intestinal crypt base produce transit-amplifying cells, which then undergo a number of proliferative cycles before terminal differentiation into absorptive enterocytes at the crypt–villus border. Enterocytes then migrate to the villus tip where they undergo anoikis and are shed into the gut lumen8. All of these cellular events are tightly coordinated by the Wnt, Notch, bone morphogenetic protein (BMP) and Hedgehog pathways9, whereas the roles of ERK1/2 remain to be charted. In the intestines, the ERK1/2 pathway is likely activated by autocrine and paracrine factors downstream of RTKs, such as epidermal growth factor receptor (EGFR)10, and by exogenous microbial-derived substrates that signal through the Toll-like receptor (TLR)/MyD88 pathway11. To study the effects of ERK1/2 in the adult intestinal epithelium, we generated mice with a conditional (IEC-specific) and tamoxifen-inducible deletion of Erk2 on the Erk1−/− background, which completely abrogates this pathway. We show that the ERK1/2 signalling module, surprisingly, is dispensable for IEC proliferation. Genetic deletion of Erk1/2 in primary IEC or treatment of colorectal cancer (CRC) cell lines with MEK1/2 inhibitors results in compensatory activation of the ERK5 pathway. Moreover, the treatment of human CRC lines with a combination of MEK1/2 and ERK5 inhibitors is more efficacious in the inhibition of cancer cell growth. Thus, compensatory signalling by ERK5 suggests a potential rescue pathway that has clinical implications for targeted therapy in colorectal cancer. Figure 1: Wasting disease associated with malabsorption in Erk1/2ΔIEC mice. Here we show that ERK1/2 signalling in mouse intestinal epithelium is dispensable for cell proliferation, while it resulted in abnormal differentiation of enterocytes, wasting disease and ultimately lethality (Fig. 1). Consistent with these findings, ERK1/2 MAPKs were shown to be associated with the enterocyte brush border and activated upon RTK stimulation or feeding27 or electrical field stimulation in polarized epithelium28. This seems at odds with literature that suggest that maintained ERK1/2 signalling precludes enterocyte differentiation29, 30. A possible explanation for this discrepancy could be that cycling IEC in the transit amplifying zone of the crypt require relatively high levels of active ERK1/2, which is readily blocked by pharmacological intervention, whereas a transition to low level ERK1/2 activity in IEC migrating into the villus compartment promotes the absorptive enterocyte differentiation program that is only perturbed upon complete genetic deletion of Erk1/2. Little is known about the role of ERK1/2 signalling in the life cycle of secretory cells in the gut. A recent report by Heuberger et al.15 described that IEC-specific deletion of non-receptor tyrosine phosphatase, Shp2, resulted in the loss of p-ERK1/2 levels in the small intestine. This coincided with an increased number of Paneth cells at the expense of goblet cells in the small intestine, as well as shortening of villi. They also observed the strongest staining for epithelial p-ERK1/2 in the TA zone. This p-ERK1/2+ staining pattern and the architectural organization of the TA zone were lost in Shp2 knockout mice. Interestingly, the deleterious effects of Shp2 deficiency were rescued by expression of constitutively active MEK1. A model was proposed in which the balance between Wnt/β-catenin and MAPK signalling determines Paneth cell versus goblet cell differentiation, respectively15. This proposed crucial role for ERK1/2 MAPK signalling in intestinal secretory cell differentiation is consistent with our observations inERK1/2ΔIECmice. Migration and differentiation are functionally intertwined in the intestines, as demonstrated by the immature phenotype of mislocalized Paneth cells observed in ΔIEC mice (Fig. 2). Critical to epithelial cell migration is proper cytoskeleton reorganization mediated by the small GTPases of the Rho family, cell polarization regulated by Cdc42 and dynamic adhesion through cell–matrix and cell–cell interaction via integrin/FAK/Src signalling31. The ERK1/2 module is used as a downstream effector of many of these pathways in the intestine, including Rho GTPases32, FAK33and Src34, and has been suggested to promote cell motility33, 35. RTK signalling also contributes to cell migration, for example, Eph–Ephrin receptor interactions are crucial for correct positioning of Paneth cells36. Ephrin receptor-induced epithelial cell migration has been shown to be mediated by Src and ERK1/2 activation37, 38, which may explain the Paneth cell mislocalization observed in ΔIEC mice. In summary, the ERK1/2 module is indispensable for full maturation of both absorptive enterocytes and the secretory lineage (Fig. 7a), confirming its crucial role in the integration of cellular cues required for determination of epithelial cell fate. Figure 7: Roles of ERK1/2 and ERK5 in intestinal homeostasis and tumorigenesis. (a) When the ERK1/2 pathway is intact, extracellular cues that are transduced via RTKs or GPCRs activate Ras under physiological conditions, or alternatively, Ras is constitutively active in colorectal cancer (RasΔ*), which preferentially activates the Raf–MEK1/2–ERK1/2 module. The nuclear and transcriptional targets of ERK1/2 are crucial for enterocyte and secretory cell differentiation, IEC migration, as well as cell proliferation under homeostatic and oncogenic conditions. Importantly, ERK1/2 activation also results in the activation of negative feedback mechanisms that suppress its upstream kinases (for example, RTKs, son of sevenless, Raf) and activate dual specificity phosphatases (DUSPs), resulting in the silencing of the ERK5 module. (b) Upon abrogation of MEK1/2 or genetic knockout ofErk1/2, the lack of negative feedback mechanisms (that is, feedback activation) results in upregulation of the Ras–Raf–MEK5–ERK5 module, which maintains cell proliferation under physiological conditions, or results in continued tumour cell proliferation in colorectal cancer, respectively. However, the lack of activation of ERK1/2-specific targets results in differentiation and migration defects of intestinal epithelial cells culminating in malabsorption, wasting disease and mortality. Compensatory upregulation of the ERK5 pathway in CRC can be reversed by targeted treatment with its specific inhibitor, XMD8-92. An unexpected finding was the redundancy of ERK1/2 in the gut with regard to cell proliferation.Erk1/2 deletion was compensated by upregulated ERK5 signalling. Genetic targeting of ERK1/2 in vitro previously showed that Erk2 knockdown is more effective than Erk1 knockdown in suppressing cell proliferation, although this may be related to higher expression levels of the former39. The effect of gene dosage was demonstrated in vivo by the observations that whileErk1−/− mice are viable12 and Erk2−/− mice die in utero13, Erk2+/− mice are only viable when at least one copy of Erk1 is present. However, mice heterozygous (+/−) for both Erk1 and Erk2 alleles were born at lower than Mendelian ratio39. More recently, it was reported that transgenic expression of ERK1 can compensate for Erk2 deletion40, demonstrating functional redundancy between both family members. Deletion of Erk1/2 in adult skin tissue resulted in hypoplasia, which was associated with G2/M cell cycle arrest, without notable differentiation defects of keratinocytes41. These data differ from our observations in the intestines, which might be explained by incomplete and transient siRNA-mediated knockdown of ERK1/2 in primary keratinocyte cultures41, compared with more efficient genomic deletion of Erk1 and Erk2 that is typically achieved by the Villin-Cre-ERT2 system14, possibly resulting in different outcomes. Both ERK1/2 and ERK5 have been described to promote cell cycle progression, although they have different upstream signalling partners, MEK1/2 and MEK5, respectively1. Furthermore, ERK2 and ERK5 proteins share only about 66% sequence identity, and MEK5 is phosphorylated by MEKK2/3, which can also activate the p38 and JNK pathways42. The ERK5 pathway is classically activated by stress stimuli, in addition to mitogens; thus, it shares features of both the ERK1/2, and p38 and JNK pathways, respectively43. ERK5 induces expression of cyclin D1 (refs 44, 45), and suppresses expression of cyclin dependent kinase inhibitors46, thereby promoting G1/S-phase cell cycle progression. Importantly, the role of ERK5 in IEC differentiation and intestinal homeostasis is currently unknown. Knockout of Erk1/2 in IEC induced activity of ERK5, which was not detectable in naive mice (Fig. 3). These data suggest that the ERK1/2 and ERK5 modules may share proximal signalling components. Although EGFR is a likely candidate in this context19, 20, we found that abrogation of EGFR signalling did not prevent enhanced ERK5 activity upon MEK1/2 inhibition. Although it was originally suggested that ERK5 signalling is independent of Ras20, other groups established that Ras, either through physiological signalling47, or by its oncogenic activity48,49, activates the MEK5–ERK5 signalling axis. Thus, rewiring of signalling networks downstream of Ras could explain the supraphysiological activity of ERK5 upon conditional deletion of Erk1/2 in the intestines. In fact, it has been shown that ERK1/2 signalling mediates negative feedback on ERK5 activity50, possibly through transcriptional activation of dual specificity phosphatases (DUSPs)51. Alternatively, ERK1/2-induced FOS-like antigen 1 (Fra-1) may negatively regulate MEK5 (ref. 52). These data suggest that ERK5 is a default bypass route downstream of RTK-Ras and activated upon loss of ERK1/2-mediated repression, thereby ensuring the transduction of mitogenic signals to the nucleus (Fig. 7b). Consistent with this concept, we found that ERK5 inhibition induces atrophy of ΔIEC intestinal organoids (Fig. 4). In addition, important downstream transcriptional targets of ERK5 and ERK1/2 overlap, such as immediate-early gene Fra1 and oncogene c-Myc, whereas c-Fos and Egr1 were specifically induced by ERK1/2 (Fig. 6 and Supplementary Fig. 7). Specificity of ERK1/2 over ERK5 and other MAPK family members for the activation of c-Fos has been previously described53, demonstrating their differential biological output despite the shared ability to transduce potent mitogenic signals. Our findings may be relevant for the use of MAPK inhibitors in the treatment of colorectal cancer. Although there was only a mild phenotype in the colons of ΔIEC mice under homeostatic conditions, the Ras–RAF–MEK–ERK pathway is generally upregulated in malignant cells including CRC54. Targeted therapy typically results in feedback activation of upstream players of the targeted kinase, which are then able to reactivate the same pathway or utilize bypass signalling routes55. For example, on activation, ERK1/2 phosphorylates EGFR, son of sevenless56, and Raf57, thereby terminating upstream signalling activity. Knockout of Erk1/2 eliminates this negative feedback. Our data suggest that ERK5 is a putative resistance pathway in the context of targeted treatment with MEK1/2 or ERK1/2 inhibitors (Fig. 7b). Different classes of MEK1/2 inhibitors display various modes of resistance to therapy (innate, adaptive and acquired)58. Since we have only used one MEK1/2 inhibitor (PD0325901) in our studies, it will be necessary to evaluate other classes of inhibitors in combination with ERK5 inhibitors. Importantly, while treatment with either the MEK1/2 or ERK5 inhibitor suppressed tumour growth in murine Apc−/− organoids, only the latter was able to inhibit the proliferation of Apc−/−;KRASG12V organoids (Fig. 6), which are more representative of human CRC. In line with this, suppression of ERK5 expression by forced expression of miR-143/145 inhibited intestinal adenoma formation in the ApcMin/+ model59, and activated MEK5 correlated with more invasive CRC in human60. ERK5 has been previously reported to mediate resistance to cytotoxic chemotherapy-induced apoptosis61. The highly specific and bioavailable ERK5 inhibitor, XMD8-92, has shown antitumour effects in multiple preclinical cancer models by inhibiting tumour angiogenesis, metastasis and chemo-resistance62. Furthermore, ERK5 inhibition does not induce feedback activation of upstream or parallel signalling pathways62. In conclusion, the ERK1/2 and ERK5 MAPK modules display a high degree of signalling plasticity in the intestinal epithelium, which has implications for targeted treatment of colorectal cancer. Scientists at the University of California, Riverside have determined the distribution of the P1 and P2 isoforms of hepatocyte nuclear factor 4α (HNF4α) in the colons of mice. They report (“Opposing Roles of Nuclear Receptor HNF4α Isoforms in Colitis and Colitis-Associated Colon Cancer”) in eLife that maintaining a balance of P1 and P2 is crucial for reducing risk of contracting colon cancer and colitis. What is already known in the field of cell biology is that the HNF4α transcription factor plays a key role in both diseases. HNF4α comes in two major isoforms, P1-HNF4α and P2-HNF4α (P1 and P2), but just how each isoform is involved in colitis and colon cancer is not understood. The intestine is the only adult tissue in the body that expresses both P1 and P2. Dr. Sladek and her team have shown for the first time that these isoforms perform nonredundant functions in the intestine and are relevant to colitis and colitis-associated colon cancer. “Our study also suggests that finding a drug to stabilize one isoform should be more effective than targeting both isoforms for treating colitis and colon cancer,” said Karthikeyani Chellappa, Ph.D., the first author of the research paper and a former postdoctoral researcher in Sladek’s lab. Dr. Sladek explained that the colonic epithelial surface has finger-like invaginations (into the colonic wall) called colonic crypts that house stem cells at their base. These stem cells help regenerate new epithelial cells that continuously migrate up toward the surface, thus ensuring complete renewal of the intestinal lining every 3–5 days. The researchers observed that the P1-positive cells were found in the surface lining and the top portion of the crypt (green in the accompanying image) whereas P2-positive cells were mostly in the proliferative compartment in the lower half of the crypt (the proliferation marker is red in the image.) Furthermore, when transgenic mice genetically engineered to have only either P1 or P2 were subjected to a carcinogen and, subsequently, to an irritant to stress the epithelial lining of the colon, the researchers found that the P1 mice showed fewer tumors than wild-type control mice. When treated with irritant alone, these mice were resistant to colitis. In sharp contrast, mice with only P2 showed more tumors and were much more susceptible to colitis. The researchers explain these findings by invoking the “barrier function,” a mucosal barrier generated by the colon’s epithelial cells that prevents bacteria in the gut from entering the body. In the case of P1 mice, this barrier function was enhanced. The P2 mice, on the other hand, showed a compromised barrier function, presumably allowing bacteria to pass through. Next, the researchers examined genes expressed in the P1 and P2 mice. They found that resistin-like molecule (RELM)-beta, a cytokine (a signaling molecule of the immune system) expressed in the gastrointestinal tract and implicated in colitis, was expressed far more in the P2 mice than the P1 mice. HNF4α has been implicated in colitis and colon cancer in humans but the role of the different HNF4α isoforms expressed from the two different promoters (P1 and P2) active in the colon is not clear. Here, we show that P1-HNF4α is expressed primarily in the differentiated compartment of the mouse colonic crypt and P2-HNF4α in the proliferative compartment. Exon swap mice that express only P1- or only P2-HNF4α have different colonic gene expression profiles, interacting proteins, cellular migration, ion transport and epithelial barrier function. The mice also exhibit altered susceptibilities to experimental colitis (DSS) and colitis-associated colon cancer (AOM+DSS). When P2-HNF4α-only mice (which have elevated levels of the cytokine resistin-like β, RELMβ, and are extremely sensitive to DSS) are crossed with Retnlb-/- mice, they are rescued from mortality. Furthermore, P2-HNF4α binds and preferentially activates the RELMβ promoter. In summary, HNF4α isoforms perform non-redundant functions in the colon under conditions of stress, underscoring the importance of tracking them both in colitis and colon cancer.